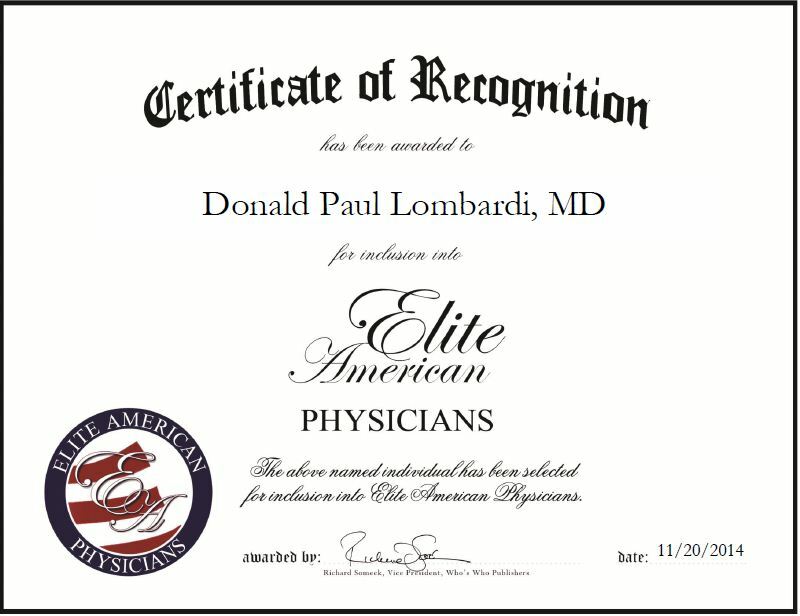 San Diego, CA, November 20, 2014, Donald Paul Lombardi, MD, President of Donald Paul Lombardi, MD, has been recognized by Elite American Physicians for dedication, achievements and leadership in oncology and cancer research. Dr. Lombardi has dedicated 22 years of service to the medical profession, and has garnered a strong reputation among his colleagues and patients for his passion to provide the best cancer care. He was inspired to get involved in cancer research after his mother and two sisters were diagnosed with breast cancer. It ignited his passion for genetic cancer research and also fueled his decision to become a physician for cancer patients. Dr. Lombardi specializes in critical analysis of all things clinical and scientific, genetics of cancer, and high-throughput technologies in genomics, proteomics and metabolomics. In his role, he is responsible for providing patients with hematological and oncological care, assessing examinations and diagnoses of disorders and diseases of the blood, bone marrow, vascular and immune system, and investigating breakthroughs in biotechnology. Dr. Lombardi won numerous awards for his work, including the House Officer Research Award and Physician-Scientist Training Award. Dr. Lombardi attributes his success to inheriting his father’s intelligence and attention to detail, as well as his mother’s warm heart and nurturing personality. This entry was posted in Oncology and tagged cancer research, diagnoses of disorders, genetics, genomics, metabolomics, patient care, proteomics. Bookmark the permalink.